Books, an incredible thing. In the “old” form (you know, the things made out of paper) they are an amazing concept – no batteries required, variety of formats/sizes and pretty great to travel with. I've always loved reading and cycling has a rich history of literature to go with it. I'm very fond of travelogues. I love the idea of being transported alongside the rider as they encounter harsh environments and interact with all sorts of people along the way. In our local library, the classic “bike packing” book prior to bike packing becoming an “it” thing was the book by Nicholas and Richard Crane- “Cycling to the centre of the earth”. A classic story of British cyclists in 1987, heading off into a third world country, cycling massive distances with a small roll of clothes on a small back rack. It is an interesting read in terms of the equipment they took and how they simplified their travel to achieve their goal. “Cycling to Xian and other excursions” by Michael Buckley was a great read from the late 80's as well. Full of stories dealing with Chinese bureaucracy, the stark beauty of the Tibetan highlands and the dichotomy of trying to get around by and with a bike in a country that did not want an independent traveler all, made it a book that I read numerous times. When my wife and I lived in Melbourne Australia for a year, I found a new wealth of travelogues to read. “Cold Beer and Crocodiles” was the tale of a cyclist, Rolf Smith, who cycled around Australia. This is one of the better written books about traveling around OZ. The writer is very capable of describing the scenes around him and talking about the human side of the trip, rather than it being all about themselves. Finally, one that isn't so much a travelogue, but certainly the story of a journey is “In search of Robert Millar” by Richard Moore. Robert Millar was on the vanguard of Anglophone cyclists in the early 80's in the pro cycling world. A Scot who lived in France and Belgium and raced there primarily, he was the highest British finisher until Bradley Wiggins won last week. A great tale of what pro cycling was like in the 80's and a wonderfully written look at a unique personality. So are you an armchair cyclist? Do you have a favourite book you'd like to share with us? Let us know in the comments section below. There's a lot going on here at VO, mostly working on new designs that I can't write about yet. But I thought you might be interested in the following updates. The VO Campeur frames just shipped out and are enjoying a pleasant South Pacific sea cruise, headed toward the Panama canal. We hope to see them in a month or so. 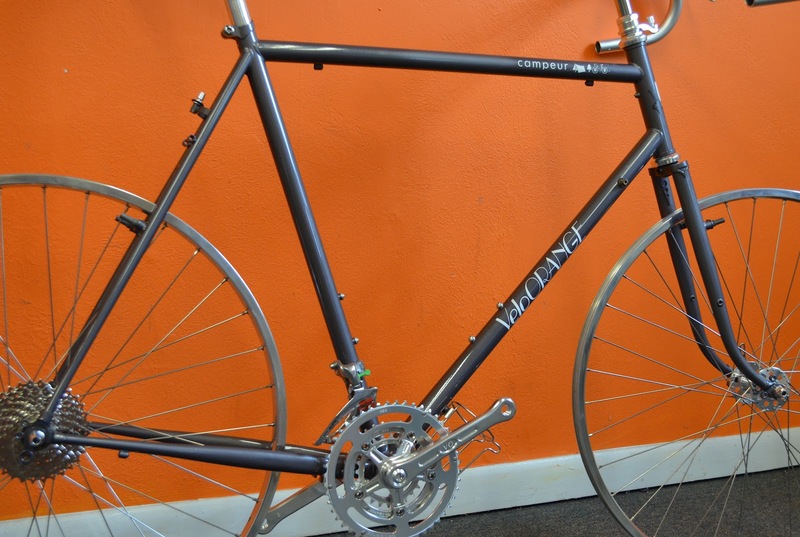 A couple of the frames shipped by air and we're currently building them up for display at Interbike. Coincidentally, or maybe not, one of them is just my size. They have a brake hanger/adjuster with a rubber ring that was hard to source, but looks neat and works well. The Campeur racks are finally in production. 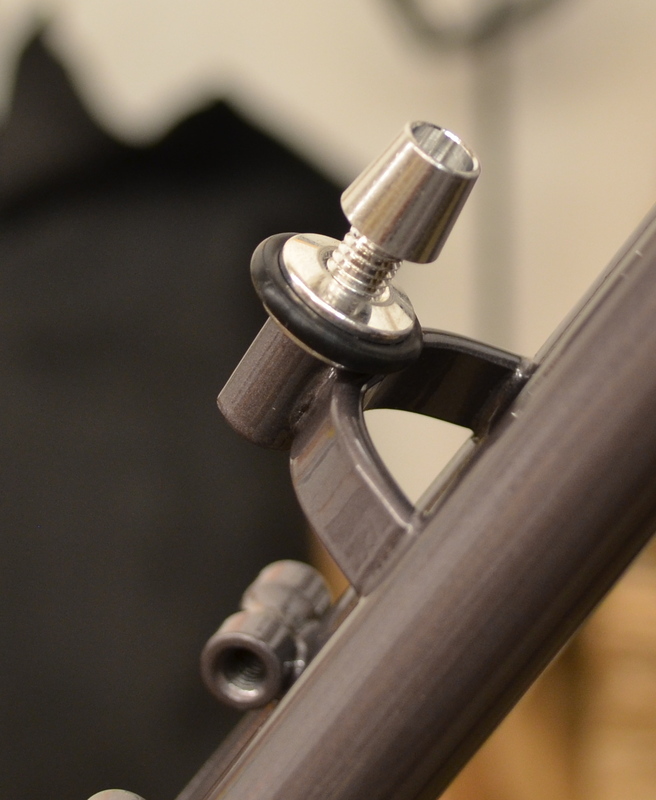 We changed the mounting hardware from flat struts to rods (similar to those used on Nitto touring racks). This change was based on your feedback. Unfortunately getting this hardware made caused major delays, but you guys convinced me that it was a better mounting system. I'll try to arrange a special sea shipment as soon as production is finished. These are all hand welded so it takes some time to make them. Our fancy Grand Cru chainguards are also in production The second version, which works with a front derailleur, is now being prototyped. If the initial prototype works as well as we hope we may have them by late fall; if design changes are required it'll obviously take longer. I think we've been pretty good about keeping stuff in stock this spring, after the low inventory disaster of winter. But now we are starting to run out of a few thing. We have two containers on the way and everything should be back in stock in a few weeks. 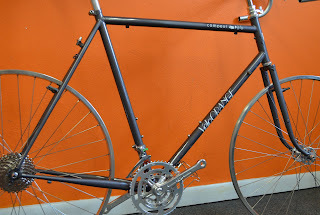 Here is one of the Campeur frames we're in the process of building up. 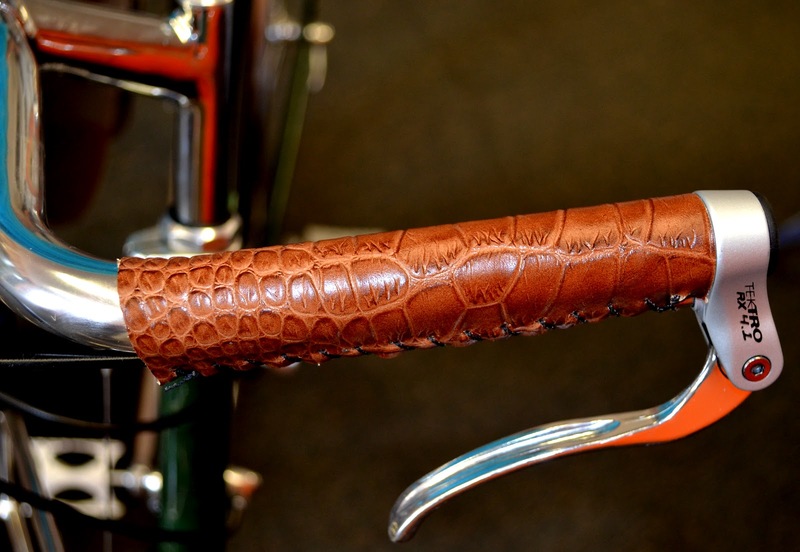 Igor has wanted to do city bar grips and bar covers and toe clip leathers in other types of leather. This is crocodile pattern embossed cow hide. We decided to make samples and I like them enough to order a few hides for a tiny experimental production run. The black actually looks better, but is hard to photograph well. They provide about as much cushioning as cotton bar tape. Yeah, this is a silly project and certainly not for everyone. But it offers a fun "over-the-top" look for those of us with impeccable style. (Or maybe not.) BTW, they are made right here in Annapolis. We should have them in stock in 2-3 weeks. I wonder if this leather might not make some cool cycling shoes? I'll admit that here is little good reason for drillium, save style. Yet it was very popular back in the day. The rational was that drilling holes in your components saved weight. Well it did, but not that much. On the other hand, it sure made your bike look fast. 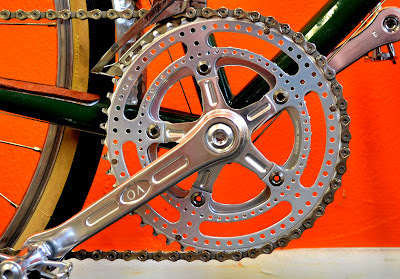 I had a drillium crank on my race bike. So I offer no excuse for this new drillium version of our Grand Cru 110bcd cranks other than that I want one for my own bike as do a few others here at VO. The photo above is of the prototype. There are more holes in the version that is now in production and should reach us in late August. The first production run is small and I don't know if we'll do another. I wonder if others will like them as much as I do? We have two other new cranks coming, one in late summer and another this winter, but we'll keep details secret for now.